You can decide to have lunch in the garden! Many cocktails for you to try! 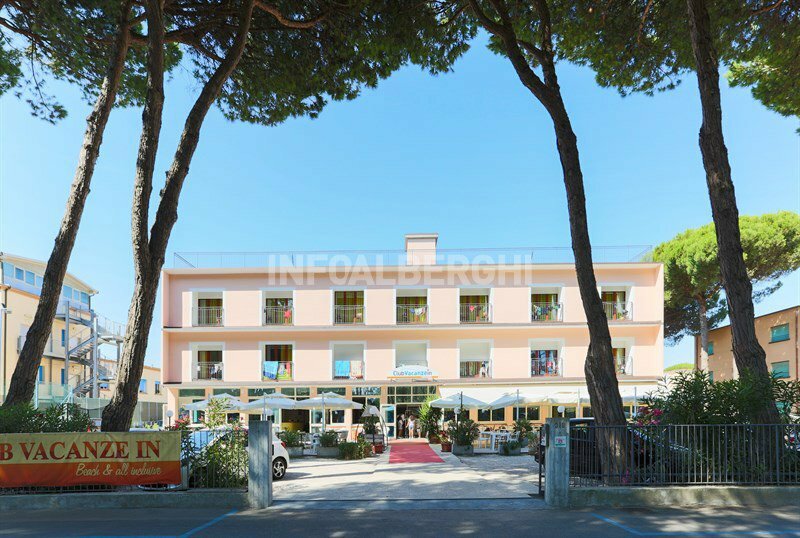 Overlooking the pine grove of Cervia, with direct access to the beach, Club Vacanze In, 3-star hotel in Pinarella, is equipped with all amenities including a garden with children's playground area, enclosed parking, bar, WI-FI and an accessible lift also to people with disabilities. It is equipped for cyclists and admits pets of all sizes. Surrounded by pine trees, surrounded by greenery that separates the streets from the promenade of Pinarella, the property enjoys a truly privileged position, with direct access to the private beach, which is a handful of steps to take in the pine grove. The rooms have balconies, air conditioning, telephone, safe, WI-FI, TV with digital terrestrial, private bathroom with shower and hairdryer. Garden, private beach, reading room with newspapers, TV room, bar, elevator. The property is equipped for cyclists and offers free use of bicycles. Theme nights with dances, games and karaoke are organized. CONVENTIONS: amusement parks, discos, gym, swimming pool, waterslide. SERVICES FOR DISABLED: entrance to the ground floor and common areas accessible, lift for disabled people, rooms on the ground floor and with wheelchair maneuvering space, bathroom with shower accessible. BREAKFAST: sweet and savory buffet, fruit juices and yogurt. LUNCH AND DINNER: buffet with meat, fish, hors d'oeuvres, vegetables, cheeses, desserts, ice cream and fruit. In hotel: strollers, entertainment, baby / mini / junior club, playground in the garden, baby sitter. In the room: cots and side rails for the bed. At meals: baby menu, homogenized, small kitchen, seats at the table, bottle warmer, afternoon snack. The property has a private beach, connected to the property through a passage in the pine grove. Prices are per person per day for a minimum stay of 3 days and include the annual cost of the card to take advantage of all CLUB services. - A deposit is required to book the room. Take advantage of the International Kite Festival from April 20th to May 1st 2019 to visit us! - free wi-fi area and parking. Availability for the weekend of June 2nd. 55 € All inclusive with beach service included! Our packages include parking, rooms equipped with every comfort, air conditioning, lift, bike rental, free entry to the Cesenatico Olympic swimming pool with turkish bath and sauna, proposals for trips and excursions in the surroundings, pets allowed. Take advantage of the holidays to relax at the spa! Each of us has the right to a cycle of spa treatments a year, which can be done through the National Health Service, and the Terme di Cervia are affiliated! Book your holiday with us and with the bus that stops in front of the hotel, you'll be comfortably at the spa! Here you will find an all-inclusive that includes full board with drinks, beach service, parking and much more. All-Inclusive Family week offer for your summer! The All Inclusive includes: full board with menu of fish and meat buffet, water and wine with meals, beach service with 2 sunbeds and 1 umbrella, free WI-FI area, parking, bike and every day entertainment for young and old. Family promotion, request your free estimate! An August holiday full of surprises! ... and many surprises !! Many discounts for families, ask for a personalized quote!